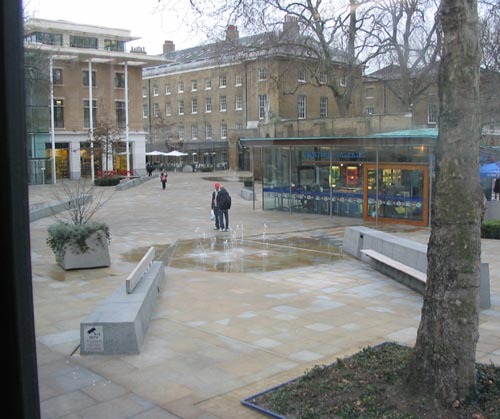 So I went past that puddle again today, on the bus again, and guess what, I photographed two more puddles in the same place - Duke of York Square, right at the Sloane Square end of Kings Road. I spotted the third one on the way back, and thought I'd missed photo-ing it, but when I got home I found that you can just about make out that one way behind the one I photoed properly, on the way. I'm starting to rather like these damn things. At least they are different. Different because stupid, but different. I am going to have to take a closer look at them. Maybe there are more that I have yet to observe. Expect lots of reflections in puddles photos, although I promise nothing.